What happens in a ministry session, —that is, the steps we follow or the protocol— is what we call the TPM PROCESS. When explaining this process, we often use two different analogies. The first analogy consists of the “Boxes.” through which every TPM ministry session typically flows. Each “box” has its own questions, designed with specific purposes, which are to be asked only in the box to which they belong. Altogether, there is a total of only nine questions used when passing through the five primary boxes (EMOTION, MEMORY, BELIEF, TRUTH, and TRANSFORMATION. When we run into an “obstacle” while applying the process, we step outside these primary boxes and use the two remaining Boxes; SOLUTION and ANGER. The SOLUTION Box is also referred to as the De-Solution Tool, which consists of three specific questions, or, when dealing with anger, we ask the specified and appropriate questions for that issue. Every person begins at the same place in the EMOTION Box. From there every person makes his or her own decision as to where he or she will go. However, we will always be in one of the seven boxes. As long as we know what box we are in, we will know what question to ask. The second analogy is that of a “Map.” (See the picture below). This map allows us to locate a ministry recipient in the process. There are only seven possible “locations” a person might find themselves on the MAP, each with its own specific question(s). Like the “boxes,” if we know where we are on the map, then we know exactly what questions to ask. Here the analogies are combined as all seven boxes are viewed as making up the possible locations on the map one might find himself. As you learn the TPM Process you will be able to work in tandem with your mentoring facilitator and even begin doing the ministry all on your own. For a detailed explanation of the TPM Process using this map click here. What follows is a very brief explanation of the TPM Process, the “boxes” and the questions that are asked. For a more detailed discussion you can read through a series of articles dedicated to doing this. Click here for more. Every ministry session begins in what we refer to as the EMOTION Box. Emotion is the smoke trail that can lead us to the lie-based heart belief that is the reason we feel what we feel. There are two questions in this “box” to help us get started. If you are connected to emotion and feeling what you are feeling, then the second question is asked: “What comes to your mind as you are focusing on what you are feeling?” This question is not asking you to try to remember something, go look for a memory or do anything but report what comes to your mind. Ideally, a memory should come to your mind through the natural process of association. If nothing comes to mind then you are probably blocking remembering because of something you believe about remembering. If this occurs we will move to the SOLUTION Box. We will learn about this box later. As you are focusing on what you are feeling, your job is to relax in your emotion and know that your mind is designed to remember through association. If you find yourself stuck in your current “story” or drawing a blank, then you are probably resisting remembering. If a memory comes to mind we will continue asking the two EMOTION Box questions until no new memory comes to your mind. Once no new memory comes to mind and we “bottom out” in the same memory, we will ask the MEMORY Box questions. During a ministry session you will probably surface a memory where you will explore it in hope to discover how you came to believe what you currently believe that is causing you to feel what you are feeling? There are three questions that will be asked while in the memory that will help you to accomplish this. These three questions are not designed to gather information or reveal memory content, but only to determine if you are connected to your emotion and to help you to understand what you believe that is causing you to feel what you are feeling. One of these questions is “How does that make you feel?” The “that” refers to the information you have shared about the memory content or any conclusion that you came to in that place. The intent of this question is to determine if you are still connected to what you are feeling. For example, if you answered this question with, “I feel rejected and alone” it would be assumed that this was what you are feeling. Now we can ask, “Why do you feel this way?” to help you to identify what you believe is the reason you feel what you are feeling? If you respond with belief information we would ask the first question again, “How does believing that make you feel?” and so forth. Depending on whether you provide emotion or belief content will determine which of these two questions that are asked. Should you start looping in your responses to these two questions, then the third question will be asked: “Why does believing [the memory content information] make you feel [what you are feeling]?” This question basically takes away your two repetitive responses thereby, breaking you out of your looping so you might explore further. “Looping” can occur for one of two reasons: it can be an avoidance of “going deeper” or it can be that you have identified your lie-based core belief. Remember we are looking for core belief (Self-identity or State of Being). We should continue to ask these questions until we start looping in our response with either a self-identity belief or a state-of-being belief. Looping with core belief is a good thing and is what we are looking for, because it is a good indication that the lie-based core belief may indeed have been identified. If you do not understand the purpose of these questions, you may think they are unnecessarily repetitive. However, they are designed to help you to look deeper and more carefully into yourself, and to bring clarity. Once a heart belief is assumed to have been identified we will next ask the BELIEF Box question: “Not is it true, but does it feel true that _______ (core belief)?” If you confirm that the belief feels true, we can then ask the Lord for His perspective and invite the Holy Spirit to grant you His truth. Your confirmation that the belief feels true provides us with a “base-line” to evaluate whether change has occurred after we present this belief to the Lord. The TRUTH Box question is one that is asked of the Lord. “Jesus, what do you want _____ to know about [the core belief]? The Holy Spirit does not always communicate truth in the same manner. Sometimes He speaks words of truth, sometimes He shows us a picture, sometimes He simply gives us understanding of or the realization of the truth. You will become familiar with His voice and His unique style of communicating with you as an individual. After we offer the belief to the Lord for His perspective, we do not need to do anything else but wait and listen. No discussion is necessary here, no additional questions or commentary is needed. We move directly to the TRANSFORMATION Box to test to see what happened. We are looking for evidence of mind renewal; more simply stated, a change in belief. We will test for transformation in belief by asking the question, “Does it still feel true that… (the lie-based heart belief)?” Here is where we look back at the “base-line” we established before asking the Lord for His perspective. If the lie no longer feels true, we can assume the Holy Spirit has granted you His truth. Only the Holy Spirit can cause the truth to become experientially believed in our hearts. No one, including ourselves, is capable of talking us out of the lies we believe other than the Spirit. Asking the TRANSFORMATION Box question is the only valid test we know of that provides us with any certainty as to whether truth has been received or not. If the lie no longer feels true, then transformation has occurred. However, if the lie still feels true, then no matter what may have been experienced, transformation has not occurred. We are looking for mind renewal not some “heavenly experience.” Nothing other than mind renewal produces transformation. It is very important that you recognize and understand all the questions asked during a ministry session. Since these are specific and predetermined questions to be asked in every TPM session, your prayer minister should not be coming up with his own questions. 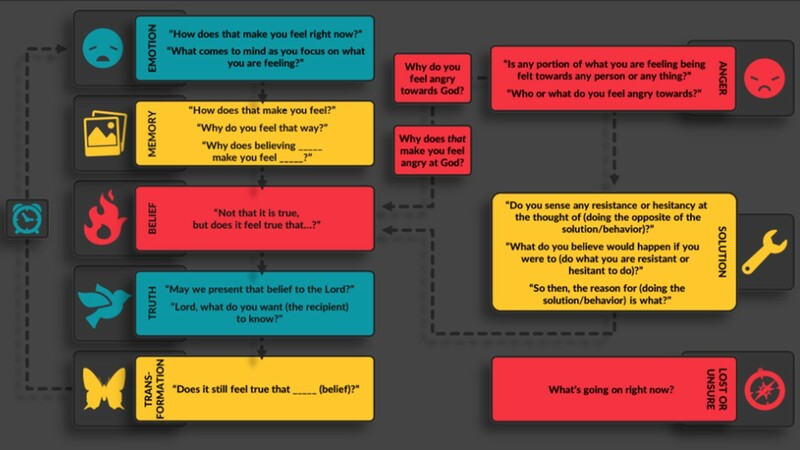 You can learn about each of these questions, and why and when they are to be asked in a ministry session, in other articles posted on the TPM website. It is very important that you learn these things well. I would also encourage you to watch the animated demonstration of this ministry process entitled “The Map” located in the PROCESS portion of the website. This animated video will give you a great overview of how a typical session should flow. Your sessions will become more successful to the degree that you understand the principles and process of TPM. This is your journey. Take full responsibility for it!